Inca Kola is an enormously popular drink in Peru, also called The Golden Kola. It smells and tastes quite a bit like Bubble Yum bubble gum, and has a sugar content surpassing Mountain Dew. It also possesses that highly valued yellow color.It is an essential part of any trip to Peruvian shores. 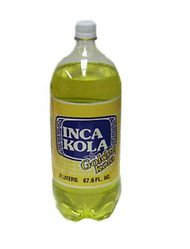 Botella de dos litros de refresco de soda Inca Kola, rico en cafe�na. I really like this drink! For me, it tastes like bubblegum infused soda.